Tribble Scratch Card Review - Casino Answers! 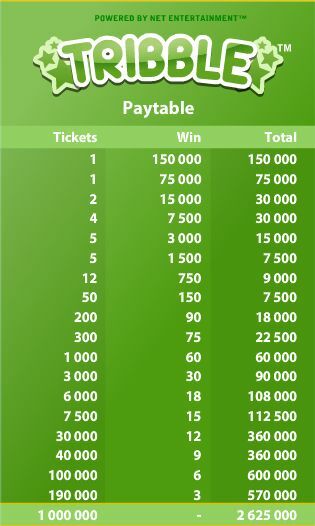 Tribble is an instant win scratch card developed by Net Entertainment, featuring multipliers. You can play the Tribble online scratch card at Bovada. The Tribble casino game is a $3 scratch card. Bets are fixed at $3 at all times. To play the Tribble scratch ticket, choose a scratch tool (bottle cap, key or guitar pick) and press the “Buy Ticket” button to generate a new card. 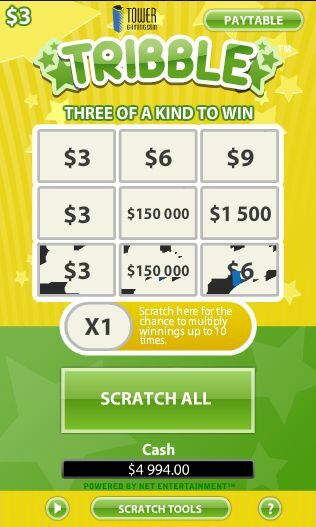 You can either scratch each ticket manually or hit the “Scratch All” button to automatically scratch the entire goal. Your goal is to match three of a kind to win the corresponding prize. Your prize will then be multiplied by the value below. The highest prize value on the Tribble scratch card is $150,000. You can win this jackpot by matching 3 $150,000 symbols on the Tribble scratchie when you play at Bovada. Tribble offers players a simple, but potentially very rewarding scratch card gaming experience. It’s not the cheapest scratch card around, but if you want to win big, sometimes you have to put forward a little more cash. To play the Tribble scratch and win ticket, please visit Bovada. Are USA players allowed to play the Tribble scratchie for real money? No, American players cannot play Tribble at Net Ent online casinos. Instead, we recommend that you play the scratch cards over at USA-friendly RTG casinos like Bovada. Is there a Tribble flash game available to play in my browser? Yes, you can play the Tribble scratch card directly in your browser at Bovada. You can play for free or real money. If you have any difficulties with the flash casino, we suggest that you download the newest edition of Adobe Flash Player for best performance. Where can Macintosh players play the Tribble scratch ticket? Mac players are welcome to use the flash casino options listed above or you can download the Macintosh casino software at Tower Casino. Where can I find more online scratch card reviews? If you want to read more reviews of other scratch lottery games, please visit our Scratch Cards section for much more!